Posted by Client Care on Sunday, February 2nd, 2014 at 3:01pm. Hardwood Floors - As previously mentioned, hardwood floors like Maple, Pecan, Beech, Cherry, Oak, Pine, Birch, Walnut, and Hickory are the current staple within the flooring industry. This is because of their ability to add natural beauty to any area and their refinishable surfaces. 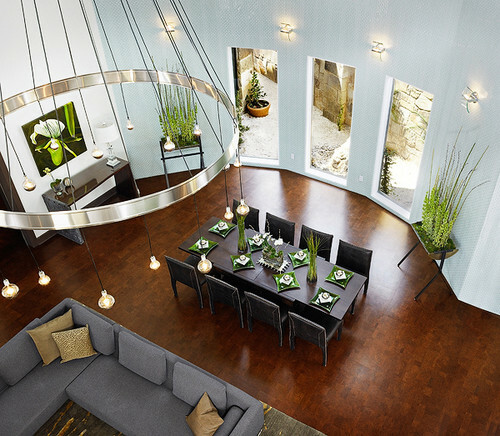 Bamboo Flooring – This type of flooring has become very popular because it is a more environmentally friendly option than traditional hardwood flooring. Bamboo is not actually wood, it is really grass, and is renowned as a more durable and versatile product. Reclaimed Wood Flooring - The reclaimed wood flooring trend involves using a product which uses materials that have been reclaimed from places like old factories or removed from an old house. Not only is it an eco-friendly option, reclaimed flooring also offers you a variety of woods and styles that may no longer be used or are really expensive to acquire. Laminate Flooring - This is one trend that has been quick to catch on, as it cheaper and more durable than hardwood or tile, and can actually mimic just about any kind of natural material. 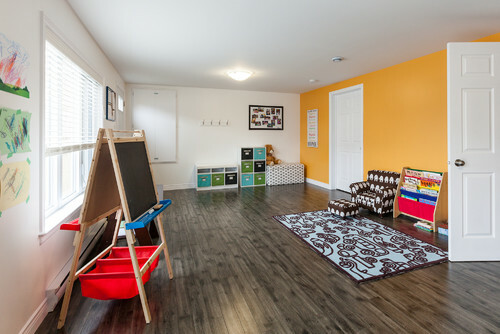 An economical product, laminate flooring is a great option when considering large spaces or heavy traffic areas. Linoleum/ Vinyl Flooring - A bit of a blast to the past, linoleum flooring is typically what comes to mind when we think of our grandma's kitchen. In the last decade however, linoleum flooring has become the go-to for an inexpensive product that will be easy to install and maintain. Ceramic Tile - A traditional choice for a clean looking bathroom, kitchen or patio, ceramic tile is the most waterproof of all flooring types. The downside of course is it does have the tendency to break, chip, or crack, if you are not careful. Another benefit is the design capabilities one has when installing a ceramic tile floor. Large-Format Tile - This trend has exploded over the last few years as homeowners have fallen in love with the clean and seamless look of large format tile. 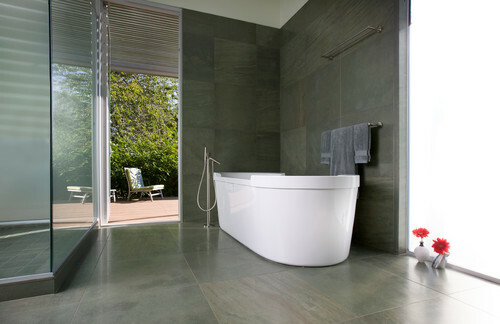 Varying in size and shape from 12 inches to 36 inches, large format tiles are a great way to fill a big space! Marble Floors - If any kind of flooring is considered more classic than hardwood it has got to be marble! Marble is known for its illustrious shine, gorgeous natural designs, and for having a certain prestige. Luxury Vinyl - This is relatively new kind of flooring which combines the upscale look of classic materials like hardwood or stone with all the durability and easy cleaning of the old school vinyl. This product has been engineered to look virtually identical to the real thing, so it takes a pretty keen eye or an up close inspection to determine it is actually vinyl. Cork Flooring - This kind of flooring not only looks spectacular, but it is known for being environmentally friendly and rather economical. A natural resource which comes from mature trees that are grown in the Mediterranean, cork is harvested every 9 years without killing the tree. Additionally cork flooring is known for its sound absorption qualities and cushiony feel. Concrete - Concrete flooring, which was once only used in industrial settings or in your garage, is now thought of as a great alternative option for a variety of rooms in your home. 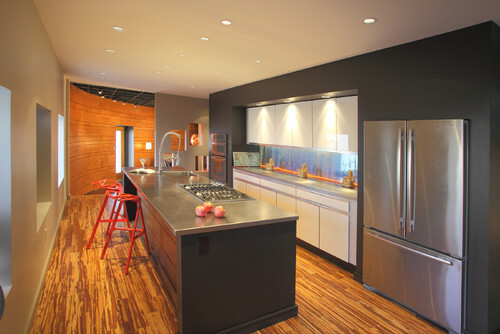 With a multitude of colors and finishes, modern concrete floors are chic, sleek, and highly durable. These floors do require a certain level of skill and should be installed by a professional to ensure they are done properly.